Bedbugs are developing resistance to some of the most common pesticides, according to a new study in the Journal of Medical Entomology. Scientists found that the insects scurrying around Michigan and Ohio were 33,333 times more resistant to some pesticides than bedbugs raised in a laboratory, and that those in New Jersey were between two and nearly 50 times more resistant to frontline insecticides than their lab-grown peers. Are we running out of ways to keep bedbugs out of our beds? To be fair, we're not totally doomed. The four insecticides mentioned above are part of a class of chemicals known as neonicotinoids, a relatively new class of pesticides, which are almost invariably found in commercial bedbug treatments. But there are other chemicals on the market that can kill creepy crawlies, and we have no reason to believe that bedbugs are resistant to them -- yet. "Unfortunately, the insecticides we were hoping would help solve some of our bedbug problems are no longer as effective as they used to be, so we need to reevaluate some of our strategies for fighting them," Troy Anderson, an entomologist at Virginia Tech and coauthor on the study, said in a statement. "If resistance is detected, products with different modes of action need to be considered." For the study, Anderson and his team first sprayed pesticides on bedbugs from Jersey City and measured how many "detoxifying enzymes"—enzymes that would protect them from the insecticide—they produced to protect themselves from the poison. They found that Jersey City bedbugs produced more detoxifying enzymes than those raised in a laboratory. Then, the researchers exposed bedbugs from New Jersey, Michigan and Ohio (along with a group raised in a laboratory) to each pesticide and recorded how much poison it took to kill half of them. The lab-raised bedbugs died almost instantly when exposed to even a small amount of insecticide—like bedbugs are supposed to. But the other populations displayed buggy superpowers, and stubbornly survived even as the researchers pumped more and more poison into them. 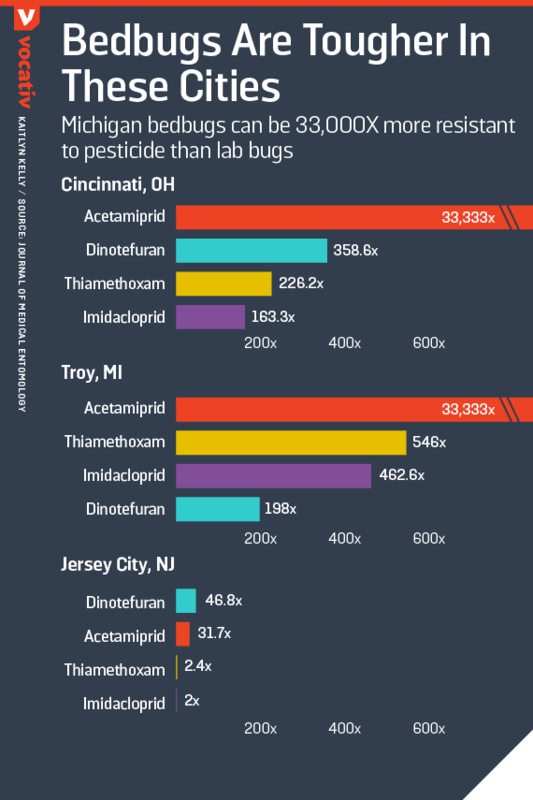 It took only 0.3 nanograms (about one third of the mass of an average human cell) of acetamiprid to kill the lab-raised bedbugs, but 10,000 nanograms (about the mass of a grain of sand) to off the Michigan and Ohio populations. That's a lot of poison for something smaller than an apple seed. "While we all want a powerful tool to fight bedbug infestations, what we are using as a chemical intervention is not working as effectively it was designed," Anderson said in a prepared statement. "In turn, people are spending a lot of money on products that aren't working." The post Great -- Bedbugs Are Now Resistant to Pesticides appeared first on Vocativ.